M is for the Money! Yes, who doesn't love those bills. Money makes the world go around. While we shouldn't make it our only aim in life, it does make things easier for everyone. Today's challenge uses a lot of greens and golds to bring this design to life. 1. I started off the base colour with two coats of the antique gold by Finger Paints Bombshell. 2. Using a small paint brush, I painted on a pastel green acrylic paint in diagonal strips; using different directions for different nails. For the accent nail, I doing a criss cross pattern. 3. 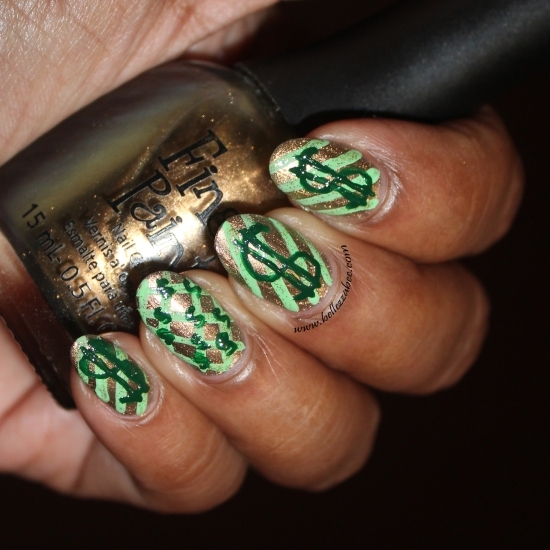 The last part of the design uses a dark green from Nabi Cosmetics and hand painting on $ signs.